I first read Thomson two years ago, when I finally picked up the copy of The Insult I bought on an Amazon recommendation while purchasing some Chris Paling novels right at the beginning of my PhD. Along with Paling, he's a novelist about whom I've been meaning to set down some thoughts about for some time, but never quite got round to it. Having just completed Divided Kingdom, now seems as good a time as any, although I'm still nowhere near sure that what I have to say is particularly coherent. Although Divided Kingdom's plot isn't particularly relevant to what interests me about it, which connects with these ideas about Adorno, Kafka, and Sara Kane, it's worth sketching in brief. In response to Britain's becoming 'a troubled place [...] obsessed with acquisition and celebrity [...] defined by envy, misery and greed', the government have implemented a 'rearrangement' in which the nation is quartered into red, yellow, blue, and green zones. These regions are populated according to temperament, with citizens of the old state being categorised after psychological assessment as choleric, phlegmatic, melancholic, or sanguine. Thomson's narrator is removed from home as a young child and packed off for a new life in the red quarter, the peaceful and unquestioning realm of the sanguine. On becoming an adult, he begins to work for a government agency involved in reclassifying and transporting problem cases. After crossing into the phlegmatic blue quarter for a conference, he finds his way into a mysterious nightclub in which he finds he is capable of recalling his childhood prior to the reorganisation: the experiences he has in this place cause him to embark upon a quest around the four sectors, pursued by secret police, in which he attempts to assert his right to live outside the absurd classificatory system. Critics attempting to pin down Thomson's weird, roving, oneiric prose latch upon all kinds of comparisons. There are elements of Nabokov in his ability to load sentences with intimations of an imminent, yet indiscernible, disaster; his scrupulously-drawn characters have shades of Dickens (and perhaps Patrick Hamilton and Jean Rhys) about them; there are marked traces of Chandler, Kafka, Ballard, and perhaps Swift. To an already heady and incongruous-seeming mix, I'd add that his narrative structures, in which individuals are deprived of social reassurances as they range desperately across wide geographic canvases, recall William Godwin's Caleb Williams, as well as the late-thirties political allegories of Rex Warner and Ruthven Todd. His contemporaries, for my money, would be Paling and, at a push, China Miéville, although his novels don't seem quite as committed to the logic of low fantasy as those of the latter. On one level, Divided Kingdom is a fabulous romp, an epic adventure story of flight and threat, fear and wonder, shipwrecks, espionage and breathless chase-scenes. On another it's a meditation on what it means to cross borders, to be alien, to seek asylum. It's a sly recasting of the nature versus nurture debate and a compelling account of personal development, of an individual's search for his own true temperament and identity. I don't necessarily have an issue with any of these claims: on some level, the novel is a simultaneously existential and political investigation of how one becomes and maintains a 'self'. 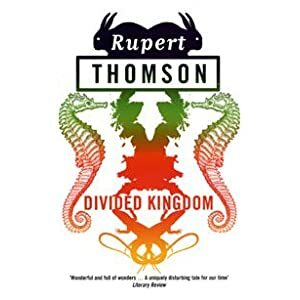 Yet I feel that, in his attempt to translate allegorical content which is ultimately as accessible as the swashbuckling story which encodes it, Royle fails to demonstrate what the real challenge of Divided Kingdom, and indeed of everything I know of Thomson's work, is. The problem isn't to elucidate a meaning, but to describe an effect, to discuss what it is in the writing that, as Adorno said of Kafka's manipulation of toponyms, makes one 'shudder'. Like Warner and Todd, allegorists whose message was overwhelmingly clear, there's a surplus which doesn't seem to dovetail with any of the political or spiritual claims dispensed by the metaphorical structure, and this excess sets off a thrilling form of discomfort. The fantastic is a direct reversal of ground rules, and therefore is in part determined by those ground rules. The truly irrelevant has nothing to do with ground rules, and therefore can no more be fantastic than it can be realistic. One may define the fantastic in part as 'conceived or appearing as if conceived by an unrestrained imagination' only so long as we remember that all imaginations are restrained at least by the perspectives necessary to create a work of narrative art. I need to go back to Rabkin to ascertain what he means by the 'truly irrelevant', but it's a term that lends itself to appropriation in this case. Thomson's writing is absolutely packed with events that gild themselves with the trappings of significance and yet are in no way recuperated into the narrative's structures of meaning. One way of describing this involves a bastardisation of Freud's notion of overdetermination, in which the proliferation of possible ideational content 'behind' or 'underneath' an image threatens to obliterate its capacity to signify. Another might be to say that the accumulation of the non-recuperable persists until it becomes structure, determined negatively. This explanation works for Kafka and Beckett, and perhaps even for Harold Pinter, but when applied to writers who have something to say, either on a psychosocial level (like Henry Green, or Thomson) or a political one (like Warner, Todd, and Thomson again) it seems somewhat jarring. Why arrange an abyss which replicates in negative the coordinates of a determinate argument? Why undercut (what appears to be) a conviction with doubt? My sense for some time has been that Warner and Todd didn't do this on purpose: it was simply a happy accident that they lacked sufficient control as writers of fiction to keep on message, meaning that their readers are presented with texts presenting a challenge far more sophisticated than their authors envisaged. I can't lay the same charge of naivety at Green; Thomson, too, is far too erudite to be a structural savant.